The US military is easing its uniform rules to allow religious wear including turbans, skullcaps, beards and tattoos, officials have said. Muslim, Sikh, Jewish and Wiccan soldiers, marines, sailors and airmen can now request exemptions to strict military uniform and grooming policies. Requests will be evaluated individually and can be denied if they hinder military readiness. Previously, at least three Sikhs had won specific accommodation. Service members' requests for a religious accommodation will be weighed on a case-by-case basis to ensure they do not impact "mission accomplishment, unit cohesion, and good order and discipline", Lt Cmdr Nate Christensen told the BBC. And appeals to be allowed to wear beards or special apparel, for example, may be denied if they hinder the safe operation of weapons or military equipment, such as helmets or protective masks. An accommodation will only apply to the service member's current assignment, requiring him or her to obtain new exemptions with every transfer, according to a copy the policy directive obtained by the BBC. The new policy, in effect on Wednesday, will extend to all religions recognised by the US military across all branches. The US military counts nearly 3,700 Muslims and 1,500 Wiccans among its ranks, according to statistics reported by NBC News, but it remains unclear how many will apply for dispensations. "We don't know how many requests we will get," Lt Cmdr Christensen said. "No two requests are going to be the same." 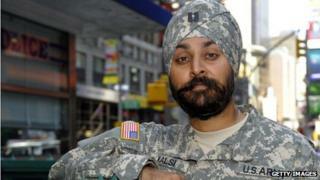 Amardeep Singh, co-founder of the Sikh Coalition, an advocacy group, described the new Pentagon measure as "a step forward" but said it still represented uncertainty for Sikh Americans, whose religion requires men to wear turbans, beards and long hair. "What is the incentive to enlist when there's such little clarity if you'll be accommodated," he asked. "It's absolutely progress that the military is stating a commitment to protecting religious liberty... However, it's clear that we have a long way to go."